Chess champion of the world; born Dec. 24, 1868, at Berlinchen, Germany; educated at the universities of Berlin, Göttingen, and Heidelberg, and took his degree of Ph.D. at the University of Erlangen. In 1882 he defeated several of the leading chess masters in a tournament at Berlin, gaining the first prize without losing a single game. In 1889 he gained first prize in the Masters' Tournament held at Breslau, and in the same year was second in the tournament at Amsterdam. In 1892 Lasker went to England—in which country he has since made his home—and won the British chess championship, defeating Blackburne by 6 games to love. In the following year he went to New York and gained the championship of America, winning all his games with the thirteen leading players, including Steinitz. In 1894 Lasker won the championship of the world from Steinitz at New York with 10 games to 5, and at the return match in Moscow, in 1896, his score was: won 10; lost 2. 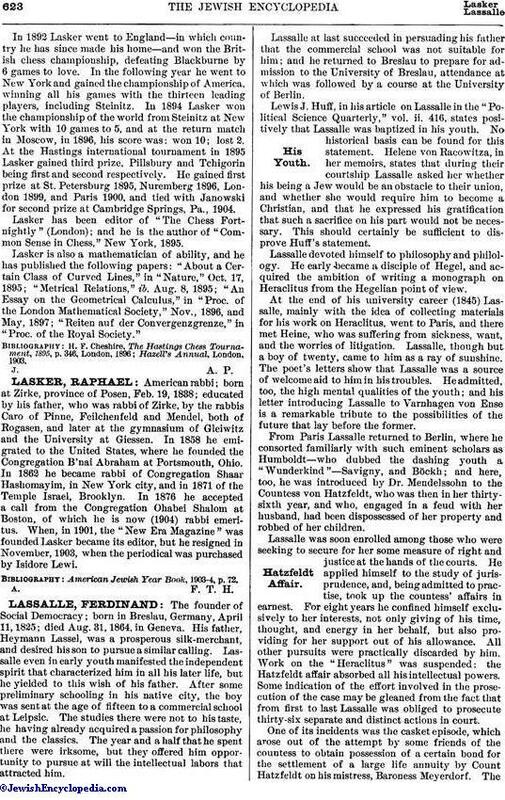 At the Hastings international tournament in 1895 Lasker gained third prize, Pillsbury and Tchigorin being first and second respectively. He gained first prize at St. Petersburg 1895, Nuremberg 1896, London 1899, and Paris 1900, and tied with Janowski for second prize at Cambridge Springs, Pa., 1904. Lasker has been editor of "The Chess Fortnightly" (London); and he is the author of "Common Sense in Chess," New York, 1895. 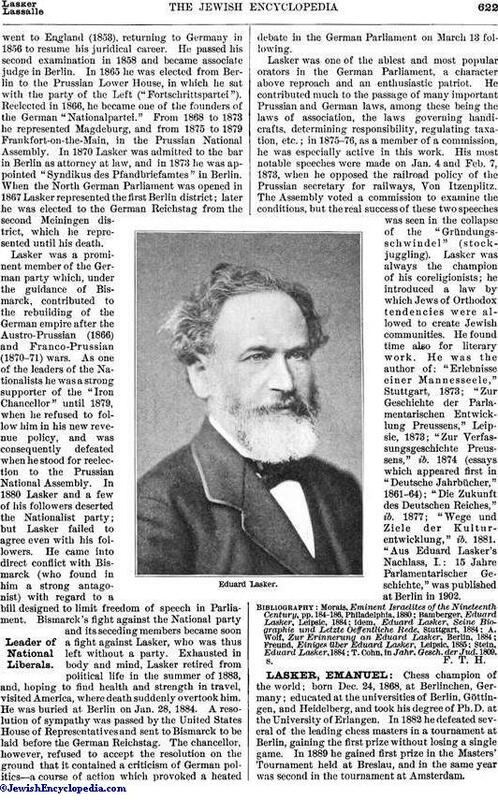 Lasker is also a mathematician of ability, and he has published the following papers: "About a Certain Class of Curved Lines," in "Nature," Oct. 17, 1895; "Metrical Relations," ib. Aug. 8, 1895; "An Essay on the Geometrical Calculus," in "Proc. of the London Mathematical Society," Nov., 1896, and May, 1897; "Reiten auf der Convergenzgrenze," in "Proc. of the Royal Society."